THE DAY WAS beginning to feel its age by the time the Taoiseach rose to his feet to announce — or rather, confirm — the new look of the coalition’s front bench. But as the day wore on, the nation began to wonder if a solution to that quagmire, massively unlikely though it seemed, might be achieved before we were told the final line-up of Enda and Joan’s New Faces of 2014. 10.30am came the word, first of all. And so it continued — by which juncture even people who cared less than a jot about it were fully up to speed on where the main jobs would be going, and there was only one thing left to figure out: just how upset was Pat Rabbitte? Not really, seemed to be the official line. “It’s a moveable feast,” came the word from the Áras. (A metaphor, you understand — there would be no mini-sausage-rolls on offer). Not that there’d be much for the President to do at the ceremony anyway. As is generally the case with this sort of thing, the main players would just have to make sure they wore their ‘State occasion’ faces and didn’t trip over any rugs. Around twenty members of the fourth estate (reporters, camera-people and various hangers-on) were waiting in the impressive State Reception Room at the Áras by the time the word went out that the Cabinet bus was finally approaching. “They’re all here,” someone called. As staff cleared from the room, various doors sprung open and a collection of familiar and not-so-familiar figures strutted in to take up their places on opposite sides of the chamber in a manner not unlike a scene from West Side Story. But why the primary school disco approach to proceedings? Shouldn’t they all be lined up together — so we can at least figure out who’s tallest? Well, no. It was ‘haves’ to the right, and ‘have nots’ to the left: in other words, the ministers who weren’t having any changes to their terms and conditions were on one side of the chamber, hanging back, to let the spotlight shine on their colleagues. After that it was rug-tripping-over time. 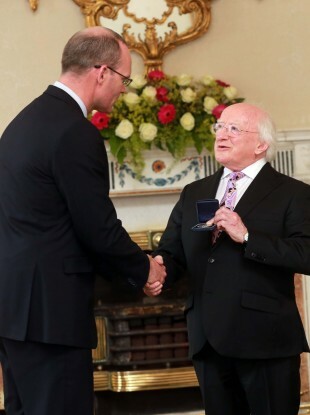 Nobody embarrassed themselves in the prize-giving-out ceremony as The Chosen Few crossed the room for a quick chat with the Pres and a pat on the back from Enda. The newly-ordained ministers then crossed to join their colleagues, seals of office pressed to their palms (except for poor Ged Nash, who had to make do with a handshake: he’s not quite a full minister you see — though he is a Super Junior one). Just a few formalities to go before everyone could get back on the bus. Most of which involved sitting down. “Could you all just move to the left slightly,” a photographer politely asked, sparking a wide grin from an already delighted-looking Joan Burton as she lined up with her colleagues for the ‘family photo’. Then there was the small matter of the first Cabinet meeting… More of a photo-op than anything else — but at least everyone got to sit-down this time. The afternoon’s schedule of walking around and sitting dealt with, it was time to leave Michael D in peace and head back to Government Buildings — to tackle the serious business of Government. And deal with more questions about Garth Brooks. Email “"Could you all just move to the left slightly?.." Fixed grins and Cabinet divisions at the Áras”. Feedback on “"Could you all just move to the left slightly?.." Fixed grins and Cabinet divisions at the Áras”.